BLS CPR course contents are written by a team of U.S. licensed board certified medical doctors. 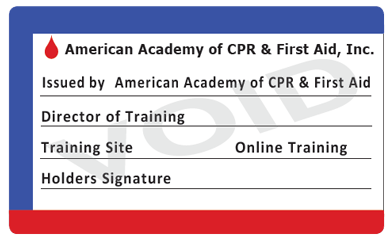 BLS CPR certification are signed by U.S. medical authorized doctors. People from all walks of life, including healthcare professionals and anyone who wants to be able to help others in the event of an emergency, can take the American Academy online courses. Choose between a variety of options, including BLS training, recertification, AED training, and cardiopulmonary resuscitation, including adult, child, and infant CPR. 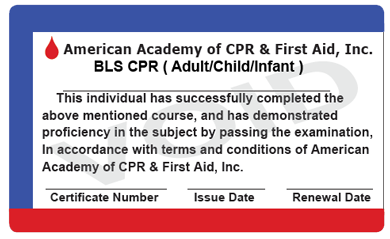 Following completion of coursework and the test at the end, BLS certification can be printed out. Board certified medical doctors have professionally written and reviewed the series of courses for BLS CPR training sessions. 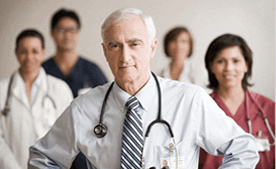 American Academy courses are all created by healthcare professionals and licensed physicians. This includes any of the American Academy popular courses for online BLS recertification or first aid certification. The online course materials take advantage of high-quality illustrations, videos, and detailed diagrams to create an online learning experience that is as close to being in a traditional classroom as possible without the drawbacks of a traditional classroom. American Academy study materials are unmatched for quality and ease of use, and thoroughly cover Basic Life Support, Automated External Defibrillators, and Cardiopulmonary Resuscitation. Each course conveys the knowledge needed to help others in life-threatening emergencies and get a BLS certification. Child, Infant, and Adult Cardiopulmonary Resuscitation. The Mechanics of Artificial Life Support. Friends and coworkers may love traditional classroom settings, but the same quality training and support are available without leaving home. FREE online basic life support training and videos. Child, Infant, and Adult cardiopulmonary resuscitation methods. Printing a two-year certificate from the comfort of your home or office. Taking courses online in a manner that fits any schedule. FREE instruction on the skills needed to save a life, including proper use of an Automated External Defibrillator. AED, baby CPR, and BLS recertification for the small price of $14.99 for the first wallet certificate, $12 for the second, and $6 for each additional certificate. American Academy basic life support courses are geared towards adults who want a quick and affordable way to get their BLS recertification. They are also ideal for those or who want to learn emergency medical skills to use within their own families. The online BLS certification course covers such important topics as infant CPR, child CPR, adult CPR, and AED training. The CPR and AED skills acquired in an online BLS Certification course teach efficient and effective response in a medical emergency. According to Wikipedia , these devices can be used by medical professionals, but have specifically been designed to be used by people who do not have medical backgrounds. These skills are reinforced with statistical information, helpful full-color diagrams, and sufficient instruction to help save lives. Who can benefit from online BLS Training and Certification? The basic life support course is ideal for professionals who need BLS Certification as part of their job. They also apply to individuals who want to have the skills to help loved ones in case of medical emergencies. It is recommended that everyone who is of able body and mind learn basic life-saving skills. The standard BLS Certification course is for those individuals who are not medical professionals but who frequently work with the public or in a public environment. For the enhancement of skills in adult, infant, or child CPR, or to obtain a BLS Recertification, our standard courses are the perfect solution. Such skills take minutes to learn, but they can be the difference between life and death for your children, your spouse, your parents, or even strangers on the street. 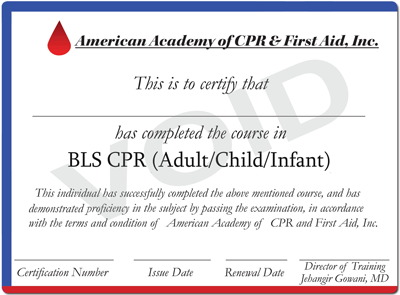 Beyond BLS CPR renewal, American Academy also offers first aid certification, Adult CPR, and Bloodborne Pathogens Certification courses. Whatever life-saving skills you need for your profession or your own knowledge can be gained by taking courses featured on this site. Get your online certifications now! Save time and expense of signing up for a traditional class by taking the BLS Certification online. All coursework offered here is available for free, 24 hours a day. Simply click on the course that is relevant to your needs and start learning now. Board certified doctors licensed to practice in the United States created American Academy's basic life support course content. Medical doctor who is an authorized, board certified U.S. physician signs the certificate. Accepted nationally by institutions such as hospitals, day cares, public & school libraries, government agencies, nursing homes, home-care agencies, construction companies, fitness centers, tattoo artists, hotels, restaurants, plumbers, and all other health professionals.